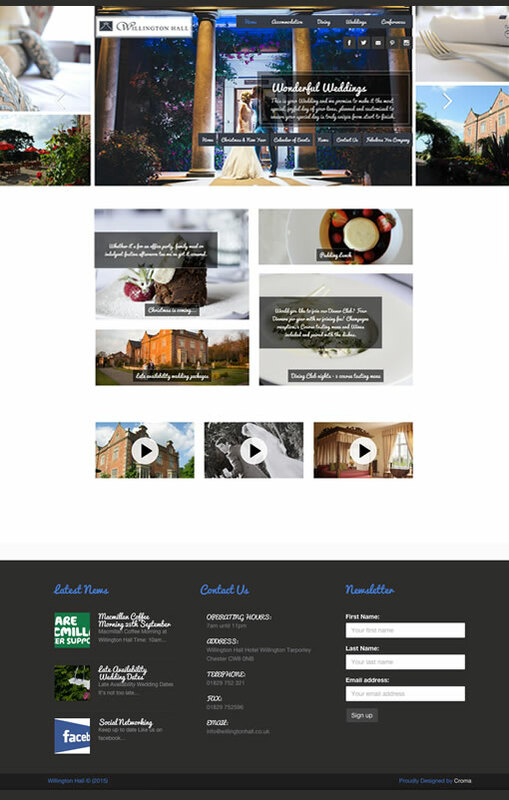 Willington Hall is a hotel web design built on WordPress CMS using the Chroma Theme. This theme is very feature rich but still required a lot of setting up. The Hotel and Restaurant have a lot of really good images which was good for building the website as an image says 1000 words! Using their images we created the collage headers that scroll across the top of the hotel web design. This theme has been specifically designed for restaurants and food based websites. This made it the perfect choice for developing the hotel web design because it had all the features they could need already coded in. The web site allows then to run a blog where they can share their latest news and allow visitors to comment on. It has an events calendar to help show when the hotel is running events and activities, and built in galleries to show off their facilities. This hotel web design was a complete redevelopment of the old website. The change over from the old site to the new one had to be handled very carefully to make sure that they kept their SEO and links in Google. We made sure to match up the permalinks and redirect any pages that were altered or removed so that no traffic was lost. Some of the redirects we did make were to better SEO links than the previously used links to improve their visibility. This theme was 2 main menus that make it very easy to section out the website and for users to find what they are looking for. The design is crisp and clean, relying heavily on the imagery to sell the hotel and restaurant. The layouts are consistent and remain looking good on mobiles and ipads. This hotel web design also makes use of handwriting fonts which work well with the overall feel of the website.